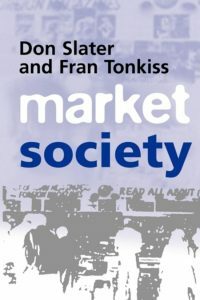 The Inner Lives of Markets; How People Shape Them and They Shape Us (2016) | Moral Markets? 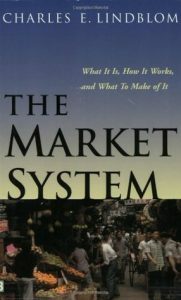 What is a market? To most people it is a shopping center or an abstract space in which stock prices vary minutely. In reality, a market is something much more fundamental to being human, and it affects not just the price of tomatoes but the boundaries of everything we value. Reading the newspapers these days, you could be forgiven for thinking that markets are getting ever more efficient—and better. 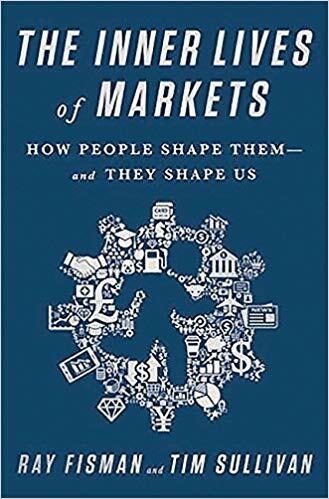 But as Tim Sullivan and Ray Fisman argue in this insightful book, The Inner Lives of Markets, that view is far from complete. For one thing, efficiency isn’t always a good thing — illegal markets are very often more efficient than legal ones, because they are free of concern for laws and human rights. But even more importantly, the chatter about efficiency has obscured a much broader conversation about what kind of economic exchange we actually want. Every regulation, every sticker price, and every sale is part of an ever-changing ecosystem—one that affects us as much as we affect it. Why it’s essential that healthy people buy medical insurance. In the end, The Inner Lives of Markets argues for a new way of thinking about how you spend your money — it shows that every transaction you make is part of a grand social experiment. We are all guinea pigs running through a lab maze, and the sooner we realize it, the more effectively we can navigate the path we want. "Taken together, this account argues that markets are not just about numbers, they are social contracts; or, more specifically, they are best viewed as a crowdsourced cultural convention to allocate resources, which rarely work quite how free-market theory suggests. [...] That might seem blindingly obvious to non-economists, and it reflects arguments that are already widespread in the discipline of economic anthropology. Indeed, one shortcoming of the book is that Fisman and Sullivan do not cite the work of people such as David Graeber or Karl Polanyi. 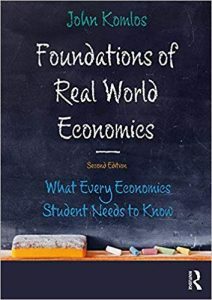 But leaving aside that quibble, the book does a good job of showing the limitations of narrow economic theory, since markets rarely feature rational people with perfect knowledge." "Fisman and Sullivan are at their best as intellectual historians, chronicling the evolution in economics from neoclassical models based on perfect competition and rational behavior to one that accommodates market failures resulting from imperfect competition, strategic behavior and irrationality. But even in that, they wind up giving a superficial account while belaboring the real-world anecdotes and examples that ostensibly were meant to inform the economic insight, not supplant it. More significantly, they fall into the now-common trap of letting their fascination with companies that are revolutionizing certain sectors of the economy — companies such as Amazon (whose founder Jeff Bezos owns The Washington Post), eBay, Google, Uber and Airbnb — blind them to the reality that the bulk of the economy still revolves around more humdrum enterprises and markets. [...] Fisman and Sullivan strain their credibility even more when they try to connect the new economic thinking to what they see as an epic battle now playing out between market fundamentalists, who see increasingly open and competitive markets as the solution to everything, and anti-market moralists, who see markets as instruments of selfishness, greed and exploitation that have been allowed to invade too many aspects of our lives." Ray Fisman is the Lambert Family Professor of Social Enterprise and codirector of the Social Enterprise Program at the Columbia Business School. His research has been published in leading economics journals. He is also a regular contributor to Slate. Tim Sullivan is the editorial director of Harvard Business Review Press. His writing has appeared in Harvard Business Review, the Wall Street Journal, Slate, and other popular outlets. The economics of platforms: is that a market in your pocket, or are you just happy to see me?